In this article I will be reviewing the plethora of Compression System options that you have today. I will be highlighting the pro's and cons to each compression system. Along with a brief description of how the compression system is built and maintained. 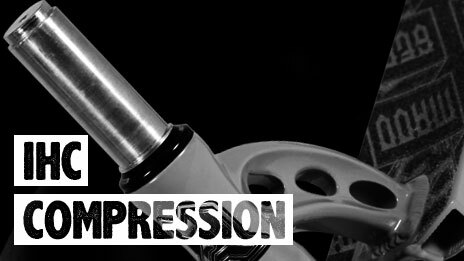 Most riders wouldn't consider this a Compression System, but it certainly is. The basic idea of this Compression System is that the fork has threads machined into the forks street tube. You would then screw a lock nut onto the forks threads until the lock nut bottoms out on the headsets top cap. A stock unsealed headset topcap has a lock nut built into it, and then a taller lock nut that sits on top of that. These two lock nuts are to be tightened against eachother to allow the front end to stay tight. If you leave the nuts loose, as you spin your bars, the front end will loosen up gradually. This is a compression system long since abandoned by the BMX industry. - Comes on most entry level complete scooters for around $100 or below. This makes it convenient for the customer on an ultra low budget. - Easy to travel with if breaking it down for your suitcase. Only needing to remove your bars, everything else stays assembled. - Due to the fork having threads, this weakens the fork. The manufacturer is taking much needed material away from the fork by creating these threads. Eventually the threads will stress allowing the fork to break. - With an unsealed bearing headset, it is hard to keep a threaded fork tight. - Generally threaded forks are the most basic fork designs you will see. A steel stamped into shape with welded gussets. This design allows the fork arms to bend with heavy riding. ICS Compression is an old system that was once used in BMX. ICS stands for Inverted Compression System due to the fact that the bolt goes vertically into your fork and screws into a starnut installed in your bars. This compression system can only be used in Standard sized bars. - At a price tag of usually $10, this is the entry level compression system when on a budget while entering the threadless fork market. - It's light. If you're a weight freak, ICS can be used with steel standard sized bars, or aluminum bars. You can also use a light clamp and even shorter bolts if your fork has the compression cap at the top of the forks steertube. Most are built at the bottom of the forks steertube to avoid having to use an 11 inch long allen key. Due to lack of materials, you can be left with a very light front end. - Starnut life can be spotty depending on what brand of starnut is used. There are a lot of weaker brands that practically break on their first use. The cheaper starnuts tend to buckle, the center rips out of the starnuts flanges. Or the center of the starnut, where the compression bolt threads in, breaks loose, spinning inside the flanges. This make it impossible to loosen or tighten your compression. Requiring you to replace the starnut. - Need to remove the front wheel to tighten or loosen your compression. - If using a fork with compression cap built into the top of the forks steertube, you need an 11 inch long allen key to tighten or loosen your compression. - Must have a slit cut into your bars to allow the clamp to fasten the bars to the fork. Slits can be fragile, more so depending on which brand of bar you purchase to go with the kit. Slits tend to allow the bars to bend, crack and eventually snap from heavy riding. - Not so easy to travel with. Must remove front wheel and take front end completely apart. This compression system is mainly used by the Ethic Brand. It is a stronger version of the previous ICS Compression. Again, ICS10 stands for Inverted Compression System 10(mm). The difference between ICS and ICS10, is that Ethic uses a hallowed 10mm bolt and starnut. Allowing the starnut to be stronger. - Stronger starnuts than what is used in the ICS Compression System. - It's light, due to having a shorter and hallowed out bolt. - Needing to use ICS10 specific forks, because of the larger diameter of the compression bolt. This limits you to only using Ethic and some Addict brand forks. - Some Ethic brand bars come with an integrated ICS10 Starnut. Which seems good on paper. But when cutting the bars down an inch to fit the rider, the starnut is now unusable due to fork clearance issues and the starnut is not removable. IHC Compression was developed by Blunt/Envy Scooter brand. IHC stands for Internal Hidden Compression. The idea behind this compression system was to provide a lighter option of HIC Compression (shown below). The compression system is built into the actual fork, unlike most compression systems. - It's light. You can run both Steel Standard and Aluminum Bars. You can pair this compression system with a light clamp. Allowing it to be stable while having the lightest options of parts. - Strong hardware. Blunt/Envy IHC comes with a solid steel bolt, this bolt has a deep allen key head. This deeper allen key head makes it harder for the user to strip out the bolt. The Blunt/Envy shim is good quality as well. No issues with the compression top cap being tightened and spreading the shim apart allowing the cap to bust into the shim. - Blunt/Envy IHC Forks have the threads built directly into the fork, avoiding any use of starnuts and the issues that may come with them after use. - Blunt/Envy is easily the highest quality IHC provider, where most other brands use their own standard sized hardware, this creates a problem with cross compatibility with other brands forks and headsets. - Some brands use starnuts in the fork. Sometimes the starnuts rip out of the forks steertube. This is an issue because the starnut is a specialty size that most dealers don't carry. - Some brands make their shims sit on top of the headset top cap, instead of the headset top cap sliding over the shim. The headset top cap is the diameter of the fork, instead of the shim (which is industry standard size for headset top caps). This also creates clearance issues when switching to another brands headset. Mini HIC, created by Madd Gear. Don't be fooled by the print in the picture displayed above or their packaging. It is not IHC. Madd Gear made a fork the same size as an IHC fork, but manufactured it with a thicker shim that matches the diameter of an HIC Compression Shim. This design basically combines the idea of IHC and HIC, to run Steel Oversized bars. Mini HIC is mainly used on the VX5 product range. - The fork is lighter. Because of the smaller diameter steertube on the fork, they managed to trim ounces off of the forks weight. - Must use Steel Oversized bars. Which goes against the idea of trying to make the product lighter. The reason IHC is so light is due to using Standard sized bars, while also having the option of Aluminum bars. My opinion on it, is they should have trimmed weight by lightening the steel bars, rather than the aluminum forks steer tube. iHIC was created by Phoenix Scooters. iHIC stands for Integrated Hidden Internal Compression System. This compression system partnered into the Phoenix TLC Fork (Thread Lock Compression). If you look closely to the photo of the fork above, you will see threads integrated into the fork. The shim for the iHIC system was solid, with no hole drilled for a compression bolt. You could hand tighten the compression system by turning the shim screwing the shim onto the forks threads. iHIC differs in one big way to any of the HIC related compression systems I have mentioned. The bars steertube was a specialty size. It was an even larger diameter than a typical Steel Oversized steertube diameter. This is a reason why the bars had an integrated clamp, as no clamps would allow the iHIC bars. - Very solid, just as reliable as HIC Compression. Stays tight for long periods of time, even with heavy riding. - It's heavy. If you thought SCS or HIC was heavy, this will trump that, easily. The extra diameter in the bar adds up, even with an integrated clamp. - No bar options due to the extra oversized steertube size. You HAD to run these iHIC Suicide Bars, nothing else would fit. - No clamp options, same reason as the last Con that I listed. Which is why the bars came with an integrated clamp system. - The bars would frequently get stuck on the shim. The only option for removal was to use a rubber mallet and pound away at your bars until the bars slipped away from the shim. Pytel Compression was created by Michael Pytel. Michael had spent a lot of time developing the design on his own over a few year period. Once he had it dialed in, Razor bought rights to it's design to use on their completes. District has incorporated the compression system into their newest range of completes as well. The design includes a dual clamp system with an integrated wedge built into both clamps, connected by a plastic sleeve to hold the bolts, keeping the clamps together. After fastening the top clamp bolts after installation onto the fork, you tighten the bottom single bolt clamp. The bottom clamp uses it's wedge design to push the clamp against the headset top cap. - This is an original design. Most compression systems are BMX designs modified to fit a scooters components. This system has yet been used outside of scooters. At least to my knowledge. - It's light. The lack of extra shims and hardware allows this to pretty much cut out the "middle man" in a sense. Most compression systems need a shim, starnut, compression bolt and top cap. This takes it back to the basic parts needed. The bars, clamp and fork. - You can run Aluminum bars, adding to the wow factor if you like light scooters. - From my experience with District's version of the Pytel Compression, it can be very spotty. It can stay tight for days before needing to tighten it or it can only last a couple of hours before coming loose. - It can be a tad annoying to tighten juuuuuust right. Sometimes I find myself putting the bottom of the clamp exactly flat with the bottom of the bar, and when I install onto the fork and tighten everything properly, it can be too tight. So I had to take the front end apart and start again by moving the clamp to a hair above the edge of the bars. It's kind of a fine tuning type of compression that if you're not used to it, it can be a little annoying to work with. - The plastic used to hold the clamps together. I have had a few customers come in and the plastic is snapped, so the clamps are completely separate. This makes the already complicated compression system even more difficult to deal with. It would be nice to see them switch to make a small sheet of steel or aluminum to avoid this problem in the future. HIC Compression is a shim with an inner/outer diameter of a Steel Standard sized bars steertube, with a compression cap and bolt, which screws into a starnut installed into a fork. HIC stands for Hidden Internal Compression. Some forks (such as an Ethic Merrow ICS10 Fork or District ICS Forks) need to be modified, by cutting the cap off of the top of the fork and installing a starnut. This system essentially pulls the fork into the shim. The HIC Compression System was created by Cory and Cary Mosbrucker, the owners of RAD Scooter Parts in Seattle, WA. - For a slightly inexpensive price compared to SCS, HIC can be a great option for the rider on a budget. 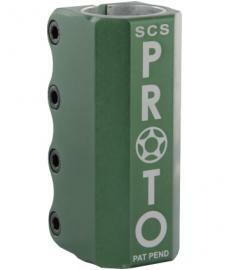 It's a solid compression system that allows the reliability of SCS (As far as staying tight). - Relatively an easy compression to work with. Just loosen the clamp and remove the bars to tighten the compression system. - Cannot run Aluminum or Standard Bars. SCS Compression was created by Andrew Broussard, owner of Proto Scooters. SCS stands for Standard Compression System. The photo above shows a quadruple clamp. But this isn't just a clamp. The compression system is built into it. The bottom two bolts have an inner diameter that matches any industry standard fork. Where the top two bolts support the bars. You can use Steel Standard sized bars in any SCS Clamp and depending on the SCS, some fit Steel Oversized and Aluminum Bars. If the clamp fits Oversized bars and you have Standard Steel bars, you simply run a clamp shim in between the clamp and bars. The compression top cap sits on a ledge machined into the center of the inside of the clamp. The bolt goes through the compression cap and screws into a starnut installed into your forks. Because the forks do not go into the bars, you cannot run a slit in your bars (unless you have an adapter shim). This is why there are four bolts. Two to secure the bars, and two to secure the fork, locking the compression system in place. - The biggest Pro of them all, NO SLIT IS REQUIRED! This means there is no opportunity for the bars to snap above the clamp. - Tends to stay tighter for longer. - Depending on the height of the fork, headtube and headset top cap, you may need to run headset spacers. This can be bad for brands like Madd Gear because of the headtube only being 4 inches tall. You don't want to run more than .75 inches of headset spacers to be sure the forks strength isn't compromised. Only option is to cut the fork and lower the starnut. Which can sometimes interfere with compatibility on future deck purchases. - Some brands do not include anti-seize out of the packaging. This restricts the clamp bolts from tightening fully, causing your compression to loosen faster, and even allowing the bars to slip or rip out of the clamp. Before installation, if the bolts do not come with anti-seize it is strongly suggested to add anti-seize to the bolts to be sure they're properly lubricated. For your safety. I believe I have covered all of the compression systems available or that have been released to the public. If you guys have any questions, let us know in the comments!